Massachusetts Archives - Solar Love! Solar development company BlueWave announced it has secured $100 million from Morgan Stanley to develop more than 25 MW of community solar in Massachusetts. MS Solar Solutions Corp., a Morgan Stanley subsidiary, will co-invest and own the community solar portfolio with BlueWave. “A core element of BlueWave’s mission is to provide all energy consumers the opportunity to go solar and reduce both their electricity costs and their carbon footprint. For those homeowners and small businesses who can’t put solar on their rooftops, Community Solar is an incredibly valuable tool to meet that objective,” explained BlueWave’s Managing Principal, John DeVillars. Two of the first solar projects managed by the joint BlueWave and Morgan Stanley venture have a capacity of 2.5 MW and are located at Oxford and Fairhaven, MA. They are currently under construction and scheduled to become active in March 2016. BlueWave said it has created several hundred jobs and saved several million dollars for is customers. The company currently has about 600 MW of solar projects in development in the US, Caribbean and South Africa. BlueWave builds community PV solar farms in local areas so residents can buy shares in them and reduce their utility bills. Some people don’t want solar panels on their rooftops and others can’t afford them or don’t own their homes, so they can’t have solar power systems installed. By purchasing shares in a local solar power farm, these people can still get some electricity from solar power without having to buy or lease their own solar power systems. They also have no upfront costs and don’t even have to own rooftop space. SolarCity, America’s number one solar provider, is set to hire 500 new employees on October 21, during an all-day hiring event. SolarCity has been growing its footprint across the US for several years now, rolling out a bevy of new programs and offerings for consumers across the country. In late September, the residential solar provider announced that it would begin offering a new solar service specifically for affordable housing communities, developers, and residents, while earlier in the month the company announced the creation of a new $400 million solar project fund. SolarCity is also joining the race for same-day rooftop solar, jumping well ahead of the current race for 7-day solar installation. And despite a net loss during the second quarter, SolarCity was still proud to announce record bookings and installations for the quarter. So it should come as no real surprise that SolarCity is not only looking to add 500 new employees, but is planning on doing so during an all-day hiring event on Wednesday, October 21. The company already employs more than 14,000 in the US, and has already been adding 500 new employees on average per month during 2015, so this new hiring frenzy is not as impressive as it may have appeared at first glance. Nevertheless, it is tellingly representative of the current demand for residential and small-scale solar throughout the US. Interested candidates for East Coast positions are invited to pre-register online at https://solarcityeastcoasthiringday2015.eventbrite.com. Interested candidates for West Coast positions are invited to pre-register online at http://westcoasthiringexplosion.eventbrite.com. A report from the Analysis Group claims the cap & trade program called the Regional Greenhouse Gas Initiative (RGGI) involving 9 New England and Mid-Atlantic states has added $1.3 billion in economic activity to the region since 2011, while lowering carbon emissions by 15%. It also says people in those states have paid $460 million less for electricity during that time thanks to the cap & trade program. “The nine New England states’ experience with RGGI can provide other states with valuable lessons for how one might comply with the CO2 regulations included in the Clean Power Plan,” Andrea Okie, a report author, told Think Progress. RGGI could be a model for other states looking to reduce carbon emissions under the Environmental Protection Agency’s Clean Power Plan, which is scheduled to be released next month. The Clean Power Plan requires states to lower carbon emissions from the electricity sector, but lets states choose how they reduce those emissions. Connecticut, Delaware, Maine, Maryland, Massachusetts, New Hampshire, New York, Rhode Island, and Vermont have reduced the amount of carbon allowed from electricity producers by requiring them to buy a credit for every metric ton of carbon they emit. There are only a limited number of permits, which are put up at auction every quarter. The states use the proceeds from the auctions to invest in further carbon reduction programs, such as efficiency retrofits and renewable energy development. New Jersey was originally a participant in the RGGI plan, but withdrew after Tea Party darling Chris Christie became governor. Christie and his ilk prefer to “let the free market” find the most efficient economic solution to climate change. He and his cronies will no doubt be waving goodbye to the rest of us as the waves close over Bayonne some time in the future. Perhaps he will take up residence in one of Elon Musk’s space colonies on Mars after the Earth is no longer fit for human habitation. Much of RGGI’s success has been the reinvestment of money from the carbon permit auction. So far, the states have spent 59% of the funds on energy efficiency; 15% on renewable energy projects; 13% on bill-payment assistance to energy consumers; 12% on other greenhouse gas programs and program administration; and 1% on clean technology research and development. While opponents of the Clean Power Plan say that it will raise electricity prices for consumers and depress the economy, putting a price on carbon has actually had the opposite effect, according to the Analysis Group report. Another report released this week by Ceres shows that US states have reduced their carbon emissions an average of 15% since 2008. By comparison, the 9 states participating in RGGI reduced their emissions by 40% during the same period. Jackson Morris, director of the eastern energy program for the Natural Resources Defense Council (NRDC), agreed that efficiency measures have been critical for lowering emissions across the industry. In the 1950s, the amount of electricity we used increased alongside our economic growth, he said. Now, there are so many ways to become more efficient, projections for our future electricity needs are flat in some places. In other words, we are getting more efficient as quickly as we are needing more power. There are other downward pressures on emissions from the electricity sector. Notably, renewable energy is a greater portion of generation than ever before. In addition, we’re seeing many of the older, high-carbon-emitting power plants go offline. Calling on the Legislature to act quickly to raise net metering caps, the Mass Solar Coalition stated recently that thousands of solar-related jobs are in jeopardy due to the caps for public and private projects. This finding was published in a final report sent recently to the Massachusetts State Legislature by the Net Metering and Solar Task Force, commissioned to provide recommendations on the future of solar policy in the Commonwealth. We might expect to hear that the solar power industry is doing well in California and it is, but the latest news is that it is growing fast in other states as well. North Carolina, Maryland, Massachusetts, New York, Texas, Georgia, and Florida are all experiencing their own big increases in solar power. This is great news for them and for the whole country. Massachusetts and Arizona have about 9,000 solar jobs each.“The clean energy economy in Massachusetts is thriving, spurred by the Commonwealth’s innovative spirit, a diverse clean technology industry, strong public-private partnerships, and world class academic institutions,” explained Governor Charlie Baker in a statement. Imagine for a moment how many people 18,000 is. When was the last time you attended a sports event or rock concert with an audience of that size? Now imagine all those people working in the solar industry, and this is just for two states. The solar power industry has quietly been adding new jobs to state economies for some time, but you probably won’t hear much about that from the mainstream media. News reports lately have been about the national economy adding new jobs, but they typically don’t dig deep into exactly what kind of jobs have been created. Many might be unskilled positions at junk food establishments or temporary jobs in offices doing data entry or answering phones. Solar power jobs tend to be skilled, so they require more knowledge and they can be satisfying. Construction workers sometimes get trained to install home solar power systems, and their skills are transferable. Solar jobs also tend to pay much better than retail or food services. “From coast to coast, solar is having a huge impact on both our economy and environment. Today, the solar industry employs nearly 175,000 Americans and pumps more than $15 billion a year into the U.S. economy – and we’re just scratching the surface of our enormous potential,”explained Rhone Resch, president and CEO of the Solar Energy Industries Association (SEIA). $15 billion a year is obviously and clearly an enormous amount of money, and yet too often is seems that the press is reporting about some negative situation related to solar. Why don’t we hear about all the positive contributions solar power is making to American society? Typically, solar power is talked about by the media as having some environmental benefits, with very little to no information about the economic advantages. Solar power could fall again in cost by another 40% in the next two years. At this point, it will simply be a “no brainer” to invest in home solar systems because they will save money and pay themselves off and then make money by producing free electricity. The public does not seem to yet understand that rather than being unaffordable, solar power has never been lower in cost. It also can be a money-making investment. Borrego Solar Systems experienced 40% growth in megawatts of solar installed in 2014. In fact, the amount of solar the San Diego-based company installed in 2014 was 30% of the total it has built over 30+ years in operation. This is one of the solar success stories you probably won’t hear about on the national or local news. For some reason, the mainstream media seems very biased toward reporting negative solar stories and very rarely reports the positive ones. “The fact that we were able to achieve 40 percent year-over-year growth in 2014 is a testament to the strong team we’ve built and the quality customers we’ve partnered with in the government, education, technology, and waste management sectors,” explained Mike Hall, CEO at Borrego Solar. -Nearly 15 MW in Massachusetts. -3.3 MW project at San Diego International Airport. In other words, next year at this time a news story about another Borrego Solar installation increase could be written. It isn’t happening only for Borrego, there is a general increase in solar installations in America that has been happening without enough press coverage or credit to the companies and workers who are making it happen. Borrego Solar took its name after Borrego Springs in southern California, where the company’s founder constructed a home solar system. Astrophysicist, James Rickard, PhD founded the company, which initially focused on off-grid solar systems. By 1999, Borrego started to switch that focus to grid-tied solar systems. In 2007, the company opened an office in Boston. In 2010 and 2011, over $100 million in solar projects was financed and developed. If you notice some themes for this company they are adaptability, expansion and longevity. Upromise was established to help families earn cash back on various common purchases that can be used to increase savings for education. “Millions of Americans are already saving for college through Upromise by Sallie Mae and now they can save even more by learning about home solar and having solar installed on their homes. This partnership is a first for our industry that will allow us to help more families save for college and potentially reduce their electricity costs by generating clean, renewable power at home,” explained Kelcy Pegler, Jr., President of NRG Home Solar. UPromise members in the select states referenced above can earn $50 for setting an appointment and then completing a learning session about solar power. For those members that buy a home solar system from NRG there is a $500 bonus deposited in a UPromise account. The premise is that UPromise members can eventually save money on their electricity bills after their home solar system is paid off. The savings then can be placed in an account to pay for future educational expenses, like college tuition. Upromise’s cashback program has earned $850 million for its members so far. That a nationwide finance company is including a home solar company’s products in its member cashback program seems to speak about how solar power is no longer a fringe consumer technology. The perception of solar used to be that it was for “greens,” “granolas,” or “enviros.” In the last several years, the price of solar power technology has decreased dramatically. Perhaps now the perception is based more on the fact that purchasing solar power systems is a good investment. Creative partnerships and financing opportunities are helping solar power expand in America. Currently, only about one percent of U.S. electricity is generated by solar power, but that percentage is very likely to grow quickly. Solar Power In One Hour? So, what made it possible to install a solar system in such little time? Three things expedite the process: solar panels that can be glued onto a rooftop, quick connect cables, and rapid permitting. If the installation process is very streamlined, like the one-hour demonstration project in Massachusetts, the cost actually might drop down to $7,500. 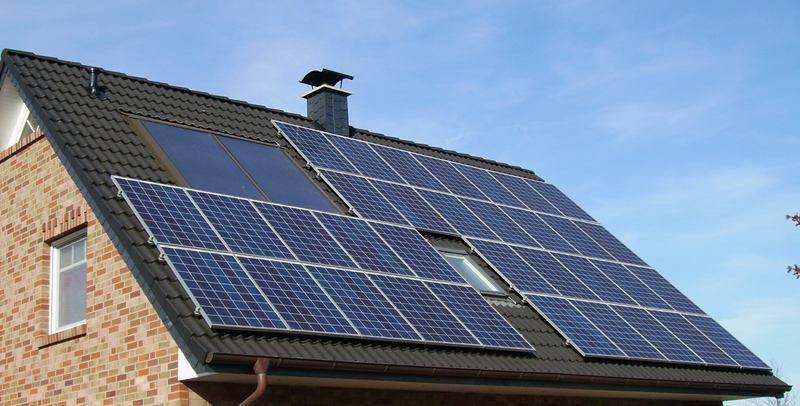 If solar panels and their connectors can be installed like adding an appliance to a home, many more people might be interested. The lower cost is obviously an attractant as well. A connector similar to the one used for charging electric vehicles connects the flexible, adhesive-backed solar panels to a rooftop. Software performs tests to make sure the new system is functioning properly and is safe. The only part of the Fraunhofer system that needs more refining is the automated permitting. That’s on the software side, so it probably can be resolved without a great deal of difficulty. “By simplifying the system so that it’s like installing an appliance, we envision that the soft cost will be virtually eliminated,” explained Christian Hoepfner, director of the Fraunhofer Center for Sustainable Energy Systems. It would be a huge advantage for home owners if they could purchase a plug and play home solar system that they can mostly install themselves in a single afternoon.